In her fifth try, Nyad reaches the Florida shore about 53 hours after leaving Havana. 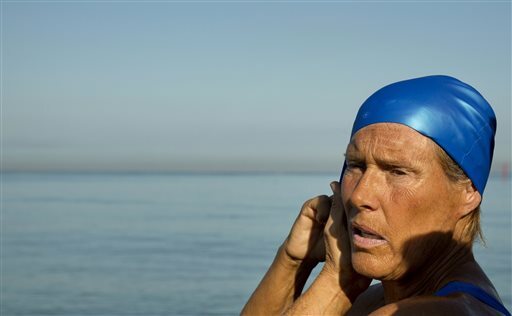 KEY WEST, Fla. (AP) — Looking dazed and sunburned, U.S. endurance swimmer Diana Nyad walked on to the shore Monday, becoming the first person to swim from Cuba to Florida without the help of a shark cage. The 64-year-old Nyad swam up to the beach just before 2 p.m. EDT, about 53 hours after she began her journey in Havana on Saturday. As she approached, spectators waded into waist-high water and surrounded her, taking pictures and cheering her on. “I have three messages. One is, we should never, ever give up. Two is, you’re never too old to chase your dream. Three is, it looks like a solitary sport, but it is a team,” she said on the beach. Her team said she had been slurring her words while she was out in the water. She was on a stretcher on the beach and received an IV before she was taken by ambulance to a hospital. “I just wanted to get out of the sun,” she said. It was Nyad’s fifth try to complete the approximately 110-mile swim. She tried three times in 2011 and 2012. Her first attempt was in 1978. “It’s historic, marvelous,” said Jose Miguel Diaz Escrich, the Hemingway Marina commodore who helped organize the Cuba side of Nyad’s multiple attempts. “I always thought she could do it given her internal energy, her mental and physical strength, her will of iron,” said Diaz Escrich, whom Nyad has described as a longtime friend. Her last try was cut short amid boat trouble, storms, unfavorable currents and jellyfish stings that left her face puffy and swollen. This time, she wore a full bodysuit, gloves, booties and a mask at night, when jellyfish rise to the surface. The new silicone mask caused bruises inside her mouth, making it difficult for her to talk, she told her team when she was about 2 miles from land. Nyad’s journey began Saturday morning when she jumped from the seawall of the Hemingway Marina into the warm waters off Havana. She stopped from time to time for nourishment, but she never left the water. Sumaya Haddin, of Miami, had been tracking Nyad’s swim before her family’s trip to Key West this weekend. She was surprised to see Nyad’s flotilla from a parasail off Smather’s Beach on Monday morning. She thought Nyad wasn’t due for another day. “You couldn’t see her, you could just see the boats. It was very exciting,” she said. Nyad is also an author of three books, a motivational speaker and has been a reporter and commentator for NPR.